← Meet the Granny Smith and Red Delicious Market Bags! Goodness, what a title to a blog post! But it does mean that the pattern is here. Once again I’ve created a handy PDF file that you can download from here safely. I’ve also created a separate file with a photo tutorial of the special stitch repeat that this design uses. It’s a really simple increase method, but is convoluted and makes me scratch my head and I came up with it! A tapestry needle to sew in your ends. Cute scissors (one can never have cute enough scissors). You can pick up the yarn via any great Scheepjes retailer in the Netherlands, or via Wool Warehouse* and Deramores* internationally. Or, clicking on any of the images in this post will take you straight to the pattern too. Don’t forget to share your finished bags on social media, you can tag and follow me just about everywhere: on Instagram, Pinterest, Ravelry and Facebook. I love seeing your finished results! 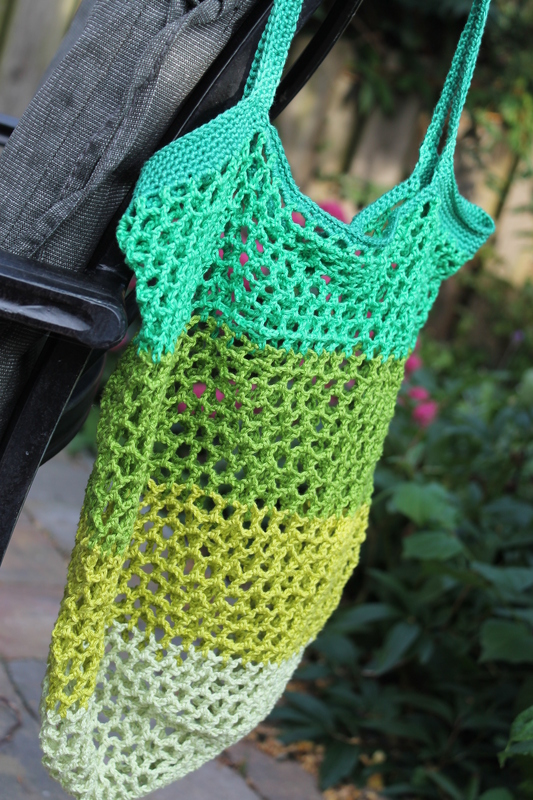 This entry was posted in free pattern, Pattern and tagged catona, crochet, crochet bag, haken, market bag, scheepjes, string bag. Bookmark the permalink. Wow that’s awesome! It looks so durable, and so handy…I’m notoriously bad about using plastic for things like market bags…such a waste! This is a much better alternative. I have a thing for mesh bags. This one looks great. Hello MissNeriss, as already mentioned on Facebook, I’ve started with the bag, but reading your pattern it seams that a piece is missing. At the chapter Straps you mention point 47 but your numbering doesn’t go further than 42? Also you mention at point 38 to repeat row 45. I can’t find a description of row 45, so please help me out? Hi Carla, I made a couple of small changes. When I initially wrote the pattern I had another colour block, but on the first trip to the supermarket the bag was hanging past my knees, so took some rows out, but didn’t update the pattern properly. Thanks for pointing the errors out, I’m adding the corrected version just now. Hi Helmi, the link to the pattern is in the middle of the post. Enjoy.